This time of year, food editor Mary McGrath’s classic shortbread cookies usually fill my apartment with their deliciously buttery scent, though the past few days my apartment has smelled like gingerbread, which is weird since I’d actually baked banana bread and cinnamon almond biscotti (with brandy!). But last night, my apartment finally smelled like butter. BUTTER!!! Mmm shortbread. It really is one of the easiest things to bake, with only four ingredients. I often make substitutions and adjustments in recipes, even with baking and especially when cooking (measurements? what’s that??? ), but there’s one recipe I’ve learned is perfect as is, and that’s Mary McGrath’s classic shortbread. I clipped it from Mary’s food column in the Toronto Star sometime in uni (dare I say exactly when that was? let’s say it was back in the ’90s), and I’ve used it every Christmas. Every Christmas. Actually, I lied. I usually use all-purpose flour in the recipe, instead of the suggested cake and pastry flour, but that’s because I didn’t understand until now what kind of difference the type of flour makes. The other night, I decided to look it up, as I was debating whether I really needed to bike out to buy cake and pastry flour, which, it turns out, is ideal for cakes and cookies that have a delicate texture. Since I’d recently met Mary at a Toronto Public Library event about shortbread (which included many delicious shortbread samples!) and had confessed to her that I’d been making her recipe for almost 15 years, I decided to try it with cake and pastry flour, as I recall her saying to the crowd of foodies that that was her preference. And, boy, does cake and pastry flour ever make a difference! The texture of the shortbread is soft and slightly crumbly. It actually makes the shortbread taste even better! 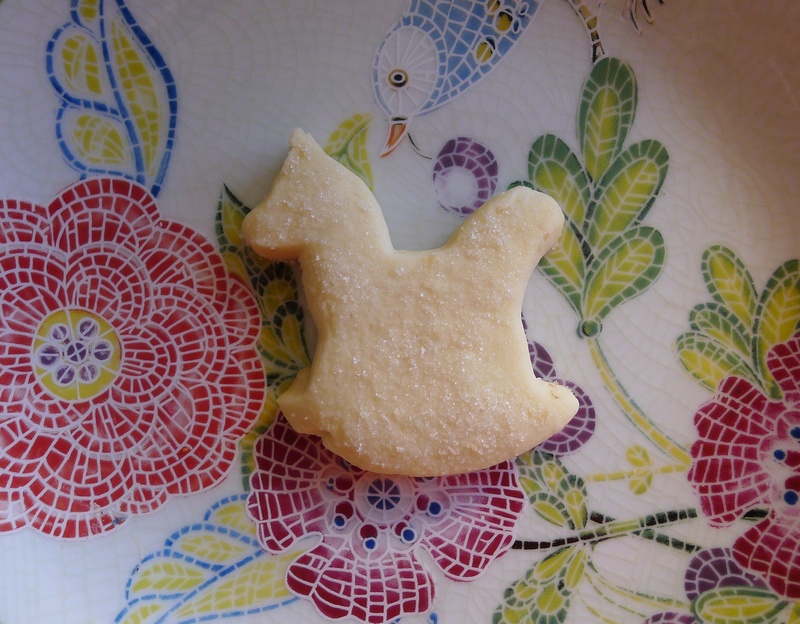 It looks pretty good too – see the delicate, yummy rocking horse above. So here’s my gift to you this Christmas: my version of Mary McGrath’s Classic Shortbread recipe (adapted from her Shortbread Sampler). OK, I guess it’s Mary’s gift to you via me! The only change I’ve made is to sprinkle granulated white sugar on top for decoration and a touch of sweetness. Sometimes I use a coarser red or green sugar for fun. In a large bowl, cream together butter and icing sugar with an electric mixer on low until smooth. In a medium bowl, combine flours, whisking well. Slowly add flour mixture to butter mixture in 4 additions, beating between additions. Scrape the sides of the bowl before adding each addition. Form dough into ball. Roll out onto lightly floured surface to 1/4-inch thickness. Cover with plastic wrap and refrigerate for 30 minutes. Remove from fridge and cut into shapes. Lay out on parchment paper-lined cookie sheet. Sprinkle granulated white sugar over top if desired. Bake for 18-20 mins or until slightly firm and bottom of cookies are golden. Let cool for a few minutes before transferring to wire rack. You may have to rotate the cookie sheet halfway through baking so the cookies bake evenly. Recipe adapted from Mary McGrath’s A Shortbread Sampler. Available at the Toronto Star’s online store, the softcover book costs a mere $10; 100% of the proceeds goes to the Toronto Star Fresh Air Fund and Santa Claus Fund. Great to find a shortbread recipe of M. Mcgrath. Thank you. I am trying to locate one that uses 1 lb butter, i cup sugar, 1/4 cup rice flour and I cannot remember how many cups of flour or which kind of flour……The recipe makes a cookie sheet of bars or 4 cakes of shortbread.. This recipe also came from the “Star” many bakes ago but I mislaid my cooking books when I moved. It is taped into a notebooks …as yet either unfound. My pleasure, Cathleen! I LOVE this recipe and my mouth is watering at the idea of making a batch next weekend. Was the recipe you lost another Mary McGrath recipe? I’m pretty sure her Shortbread Sampler is available at the Cookbook Store in Toronto. Otherwise, you could try e’ing The Star’s food editor or the editorial assistant for the food section — they must have a database of all the recipes they’ve published. what if i wanted chocolate ones? just add cocoa to the above recipe? Hey Anisha, I suppose you could try that, but these cookies already have a perfect crumbly texture because of the cake and pastry flour, so increasing the dry content might make them TOO dry and TOO crumbly. Plus, there isn’t loads of sugar here, so cocoa could make the shortbread taste bitter instead of buttery. You could try dipping the tips in melted chocolate. Or make snowman shapes and decorate with chocolate chip buttons before baking. Sometimes I do that, but, really, this shortbread is simply divine as is — why mess with a good thing? your recipe worked like a charm.. was crumbly and perfect with cocoa too.. i’m back to making more cookies today :-)… thanks for a lovely recipe.